Released by Random House in the mid-1990's, this was one of several books from the firm that was aimed toward catering a very young audience. Unfortunately, this publication makes for a rather tepid experience all around. 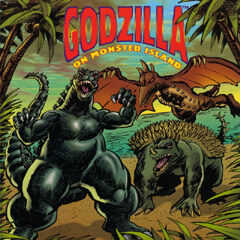 In terms of the story, it focuses on a oval shaped object washing ashore Monster Island that Anguirus and Godzilla decide to protect. As expected, a number of the other inhabitants of the island want to destroy it, as the pair fight off Kumonga, Kamacuras and Gigan (whose inclusion as an inhabitant of Monster Island is bizarre). Eventually, humanity catches wind of the object, and sends Mechagodzilla to defend it, causing Rodan, who is drawn in the hideous "Trendmasters look", to join the fray as Godzilla eventually defeats his metal doppelganger. Following this skirmish, the object hatches to reveal that it was a cocoon with Mothra, Imago, inside. Overall, the story is more complex than one would expect from the title's target audience, although there isn't much to praise about it all the same. The idea of having Mechagodzilla sent to defend the cocoon is an odd one, and the writing clashes with this explanation as details like "cruel yellow eyes" are used to describe the mech. Unfortunately, in that vein, the quality of writing in general is pretty bad, even with the given age group in mind. The biggest problem is simply that it moves from point to point at such a rapid pace that the words sometimes feel like they are leaving the images behind. In retrospect, it probably would have benefited if the action was condensed, like removing one of the battles in order to better explore another. Despite the writing's faults, though, the biggest blemish here is simply the rather unappealing art, which was done by Tom Morgan and Paul Mounts. It's unfortunate, but really the only decent shot in this book is the one on page 6 and 7 that show Varan and Anguirus looking over the cocoon. Otherwise, the book is just filled with drawing after drawing that misses its mark, with many looking like it was a rough sketch that was then going to be replaced with a more fleshed out drawing that never came. Bottom line, unless you are a diehard collector, there is little reason to search this book out compared to most of the others that Random House distributed.